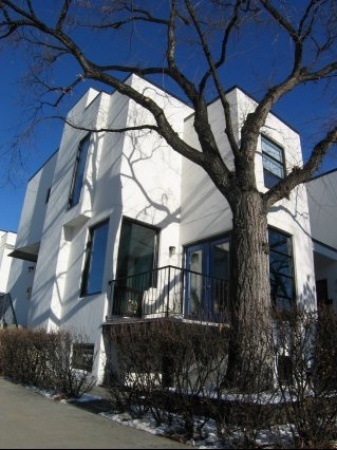 These 11 townhouse homes were built by the local Battistella family in 1993 from a design by Sturgess Architecture with art deco styling that makes this development look like it was built in the 1920s or 1940s. The city's zoning and condominium's bylaws here allow home businesses attended by the public, today called "live/work" condominiums. The homes are grouped around a courtyard that's open to the west, and which one Realtor has described as a, "...Japanese fusion garden courtyard and pond".The five homes fronting onto Thirteenth Avenue are of three levels with the lowest half below grade with "walkout" access, and some of these are developed into a true office or even a small suite. The homes at the back are of two levels on a raised concrete deck, allowing for indoor common-property parking beneath them, and a second on-the-drive spot outside each garage door. There's one smaller home measuring 843 square feet., but most are 1,250 or more, and four of them are about 1,780 square feet, so those surely have space for a home office. Seven of the homes have a front foyer or another portion of the floor plan that spans two levels, giving an open feel and extra light. One of the larger homes was extensively renovated and upgraded in 2002, such that it enjoyed a half-page spread in the Herald on September 25, 2004, when that suite was up for sale.This development voted back in 2001 to make all exterior doors and windows each homeowner's responsibility, but it's a conventional condominium with common responsibility for all other exterior components and gardening. Owners pay a condo fee for those expenses, of course, but also pay directly for their own utilities. Exterior cladding improvements were done in the winter of 2010-2011. As my photo shows, this is a special little development with a lot of character. The Battistella boys don't built 'em any other way. I keep the Condominium Plan on file.